There are no words to describe the looks that passed over my boys faces when we first passed through the enchanted entrance to Diagon Alley in Universal Orlando's newest Harry Potter addition. Awe and wonder took turns gracing their faces as they peered into shop windows, watched as magic literally happened right before their eyes from the wands of others, spoke with a goblin at the Gringott's Money Exchange, and watched the fire burst forth from the mighty dragon atop Gringotts Bank. We spent hours wandering the streets of Diagon Alley, and came up with a list of 15 things you can't miss when you visit. The number one thing you shouldn't miss when visiting Diagon Alley in Universal Orlando, is the Escape from Gringott's ride. The effects in this ride are absolutely spot on. It literally places you inside the movie, and take you on a wild adventure with Ron, Hermione and Harry. For those of you who feel the Forbidden Journey ride is too rough for them, you will be pleased to know that the new Escape from Gringott's is more forgiving on your stomach. Be sure to arrive first thing in the morning for the best chance at short lines, and remember, guests of a Universal hotel get in an hour early to experience the land. As you enter Diagon Alley, there is one figure that dominates the sky, and that is the figure of the Ukrainian Ironbelly dragon high atop Gringotts Bank. Do not miss his spectacular display of skill as he breathes fire into the air every 15 minutes or so. Listen for his low grumbling and roaring to know that the fire is coming soon. If you've ever dreamed of talking to a goblin, now is your chance at the Gringotts Money Exchange. Step inside and ask the goblin who wishes to be referred to as "Sir" anything you wish about goblins, the bank or anything else that comes to mind, but don't expect a cheery answer. Fun tip, you can trade in your muggle money for Gringotts Bank Notes that you can either keep or spend in the Universal parks during your visit. No trip to Diagon Alley would be complete without taking a trip down the side street to Knockturn Alley. The mood instantly changes from cheery to creepy in an instant, as mermaid skeletons and talking heads lurk all around you. Be sure to enter Borgin and Burkes and see if you can find the hairy hand that scared Harry Potter when he first landed in Knockturn Alley after attempting to use the Floo Network for the first time. The Leaky Cauldron is a must see, and if you can, splurge and have a meal there to enhance your experience. Serving up a wide range of dishes straight from the streets of England, you can also get butterbeer here, and for a limited time during the holidays, you can get hot butterbeer too. Be aware that no soft drinks are served here. Located in London just outside the entrance to Diagon Alley, the Knight Bus is a must see. Have a conversation with a shrunken head and pose for photos with the conductor. Take a stroll down London streets and stop at 12 Grimmauld Place to see the headquarters of the Order of the Phoenix. Be sure to wait a few minutes to see Kreacher the house elf appear in the window above the door. If you are in the market for a new wand, do not forget to partake in a wand choosing ceremony at Ollivander's Wand Shop in Diagon Alley. You can now purchase new Interactive wands for a slightly higher cost that allow you to perform magic acts at various locations all around Diagon Alley and Hogsmeade in Islands of Adventure. Need a special potion? Stop by Eternelle's Elixir of Refreshments stand to pick up your potions for everything from love to fire protection. You can drink the potion straight from the vial, or dilute it in a bottle of water if it's too strong. In the streets of Muggle London, there is a bright red phone booth on the sidewalk. Children are naturally drawn to it, but there is a secret surprise waiting inside. Dial the magic number located on the phone for a fun conversation experience. That's right, Diagon Alley has brought Florean Fortescue's Ice Cream Parlour to life, and they serve butterbeer ice cream among other delicious flavors including chocolate chili and sticky toffee. Live performances take place throughout the day in Diagon Alley on the stage/steps located near the Gringotts Money Exchange. Do not miss one of these magical performances featuring Celestina Warbeck, the singing sorceress, and the Banshees. You can't visit Diagon Alley without stopping in for a peek at the goodies that await in Weasleys' Wizarding Wheezes shop. Now bigger and better than ever, you can pick up anything you need for a good prank at the Weasley brothers' novelty joke shop. Keep your eyes peeled or you might miss this unique video catching experience. As you turn around one of the bends in the queue for the Hogwarts Express, look for people mysteriously popping through Platform 9 3/4. If you pass it, you would never know you are walking through it yourself. Perhaps the best experience in all of Diagon Alley is the ride you can take between the two Universal Parks on the Hogwart's Express. Universal has gone to great lengths to make this experience as authentic as possible, down to purchasing the same fabric used in the train seats in the movie for the train at Universal. High definition screens act as windows, taking you across the English countryside and on to the magical world that awaits at Hogwarts and Hogsmeade. Pay close attention and ride more than once to catch all the special effects. The new Diagon Alley area at Universal Orlando is a must see experience for any Harry Potter fan, and a delightful experience for even those muggles who have no clue who Harry Potter is (yes, some of those still exist.) If you have been looking for the perfect way to immerse yourself in the world of Harry Potter, then start booking your trip to Universal Orlando and Islands of Adventure today! Our park tickets were provided, but all opinions are our own. My kids would have a ball here! Granted, they have no idea who harry potter is but they would catch the idea behind everything. That looks amazing from start to finish!! I really really really want to go and experience all of it myself. Can't believe how closely it resembles the movie. I would love to take my kids to see that! We love the Harry Potter movies. Thanks for the sneak peek! I have not been to Universal Studio's in years but it's on my bucket list for travel. Looks like it's changed so much. IT has been a long time since I have been to universal studios this looks like something my older kids would love it. I'm so excited to see all of this! We haven't been to Universal in a long time. We are planning a weekend in December. This is a great list. We haven't been to Universal since Diagon Alley opened, and my whole family is hoping to make a visit soon. It looks amazing. That looks awesome. Can't wait to see it next trip. I'm so jealous! I have wanted to go to Diagon Alley for quite some time now! I would love to go to Orlando! I also love Harry Potter, this looks so fun! Fantastic list! I really want to go someday. I just can't imagine the attention to detail and technical expertise that went into designing that place! I've heard it is amazing. I love the pictures and I'm glad you got to go! Oh my gosh, what an amazing time this would be! My kids would have such a blast. Never mind that, so would I! I can't believe I haven't been there yet. It look so much fun! How fun! My kids and I would have an amazing time and indulge in something we usually don't spend a lot of time discovering. I promise I would spend so much time with them there! I know you had a blast. Did you try the butterbeer? I agree with your list. I actually was just there a few weeks ago and it was SO MUCH FUN! The frozen butterbeer was awesome too! This sounds like a dream for any Harry Potter love. I have a friend whose son loves these books. I will have to tell her about this. We are going there next summer so it's good to know of what we must do. Thank you for this. Oh wow. How fun. Definitely on my to do list when I get to Orlando. So much has changed there! Looks like so much fun and we will have to check it all out on our next trip there! I have to say- this is one AMAZING article! We just visited Universal and you are making me want to go back! I missed all this!! 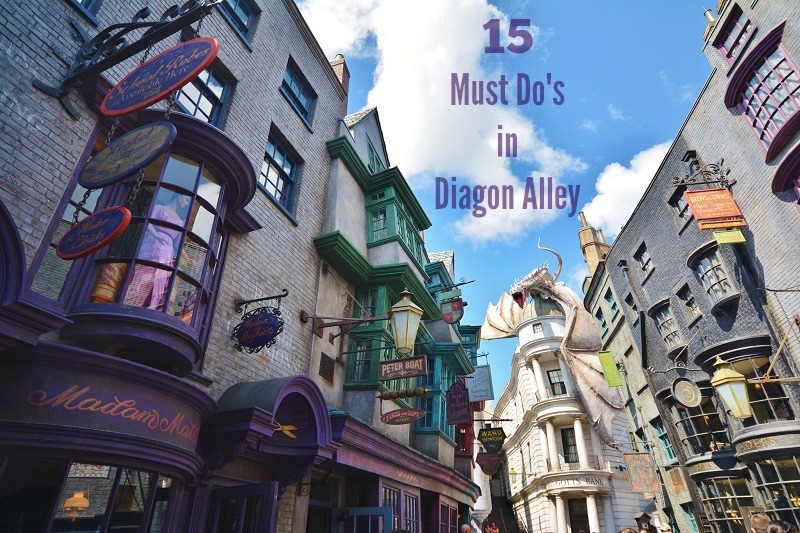 You need an entire day to see all that Diagon Alley has to offer!